You are browsing the archive for Malaysia. To promote global participation and sustainable discussion for the future of open data, remote participation is crucial for communities who are unable to attend the conference physically. Even though face to face interaction is the best way for communication and decision making, physical participation comes with a high price to cover incurred costs for travel, accommodation and per diem. Following are four points that we, as the global, digital & data driven community, need to consider when we talk actively about diversity and inclusiveness while supporting communities who are facing difficulties in constraint environments. The Open Data field has many challenges to deal with, as well as strategies and shared experiences. Wouldn’t the discussion be more thought provoking when sessions are adaptable for remote panels where anybody and everybody from around the world can contribute their input in the session? We don’t need to eliminate the panel format entirely, but there should be a flexibility where panel format can be changed from its traditional form to reduce the interaction of barriers between moderator(s), speaker(s) and audiences. For an example of this in practice, the Data + Accountability I session was in an un-panel format. The un-panel format is the opposite of panel format where there are more live interaction and feedback from the attendees/participants with speakers and moderators. This format is done off the stage and most of the discussion made in a circle. This allows better knowledge sharing. As a requirement, I propose at least three moderators to able to moderate the discussions in verbal and in written because handling participants from around the world are challenging. Best example found so far: The Open Exchange Facilitation workshop. The flow of the workshop was moderated by three people (2 of which were monitoring actively in the chat room) with very clear participant guidelines, and it was done in remotely via GoToMeeting. Additionally, careful planning is crucial to allow smooth operation throughout this session. When it comes to igniting discussions and encouraging feedback, diverse participants are important in making the discussion itself more inclusive. For example, who would have known that a country like Malaysia would benefit from applying social audit approaches practiced in Kenya to hold the decision makers accountable? As a follow-up to point 1, we have to approach the right target group(s) that are reliable and responsive in respective projects while sharing common goals. I echoed this point in an article on the creation of elites, how can you address the repetition of participation of small groups of elites that claim to represent the minorities and the communities in their respective country/region? Following are four groups that we, the open data community, need to consider approaching particularly: non-tech skilled persons that have experiences in rights-based issues, tech experienced individuals, intermediaries, and beneficiaries. This is not just any a typical kind of window shopping. This is window shopping for funding. Can IODC be more than just a one-off meeting point? Wouldn’t it be great if some percentage of the conference budget allocated to fund projects at the end of the conference? There is another way to have an added value for IODC: fund small scale & measurable open data projects by regions. This is where organisers of sessions participate with a mission to not just bring ideas and share it with the world but to make it come to life in small projects. IODC can become a platform where organisers of sessions begin to experiment their ideas that can really lead to social change. – Is a centralized hub a useful contribution for remote participation? Are there any existing examples? There is a need for capacity building internally and externally so the open data community can ensure local communities understand the importance of open data. This will entail further training/coaching people to make use of open data, putting the pressure on policy makers to implement better National Action Plans, improving Freedom of Information policy, and a renewed focus on better open government policy. Therefore, let’s spare some energy to make IODC more inclusive and diverse through remote participation and see how we can grow together collectively as a movement. Comments Off on How we, as Open Data community, can improve International Open Data Conference (IODC) together? “Open Spending Data in Constrained Environments” is a project being lead by Sinar Project in Malaysia aimed exploring ways to of making critical information public and accessible to Malaysian citizens. The project is supported by the Open Data for Development programme and has been run in collaboration with Open Knowledge International & OpenSpending In Malaysia, fiscal information exists at all three levels of government, the federal, the state and the municipal. There are complicated relationships and laws that dictate how budget flows through the different levels of government and, as the information is not published as open data, by any level of government, it is incredibly challenging for citizens to understand and track how public funds are being spent. This lack of transparency creates an environment for potential mismanagement of funds and facilitates corruption. Earlier this year, the prime minister of Malaysia, Dato’ Seri Najib Razak, announced the revised budgets for 2016 in response to slow economic growth, that is a result of declining oil and commodity price coupled with stagnant demand from China. As a result, it was paramount to restructure the 2016 federal budget in order to find a savings of US $2.1 billion. That will make possible for the government to maintain its 2016 fiscal budget target at least at 3.1 percent of the country’s GDP. One of the biggest cuts from the revised 2016 budget is the public scholarships for higher education. When numbers get this big, it is often difficult for people to understand what the real impact and implications of these cuts are going to be on the service citizens depend on. While it is the role of journalists and civil society to act as an infomediary and relay this information to citizens, without access to comprehensive, reliable budget and spending data it becomes impossible for us to fulfil our civic duty of keeping citizens informed. Open budget and spending data is vital in order to demonstrate to the public the real life impact large budget cuts will have. Over the past few months, we have worked on a pilot project to try to make this possible. While the federal budgets that have been presented to Parliament are accessible on the Ministry of Finance website, we were only able to access state and municipal governments budgets through directly contacting state assemblyman and local councillors. Given this lack of proactive transparency and limited mechanisms for reactive transparency, it was necessary to employ alternative mechanism devised to hold governments accountable. In this case, we decided to conduct a social audit. Social audits are mechanisms in which users collect evidence to publicly audit, as a community, the provision of services by government. One essential component of a social audit is taking advantage of the opportunity to work closely with communities in order to connect and empower traditionally disenfranchised communities. Here in Malaysia, we started our social audit work by conducting several meetings with communities living in public house in Kota Damansara, a town in the district of Petaling Jaya in Selangor State, in order to gain a better understanding of the challenges they were facing and to map these issues against various socio-economic and global development indicators. Then, we conducted an urban poverty survey where we managed to collect essential data on 415 residents from 4 blocks in Kota Damansara public housing. This urban poverty survey covered several indicators that were able to tell us more about the poverty rate, the unemployment rate, the child mortality rate and the literacy rate within this community. From the preliminary results of the survey, we have found that all residents are low income earners, currently living under the poverty line. 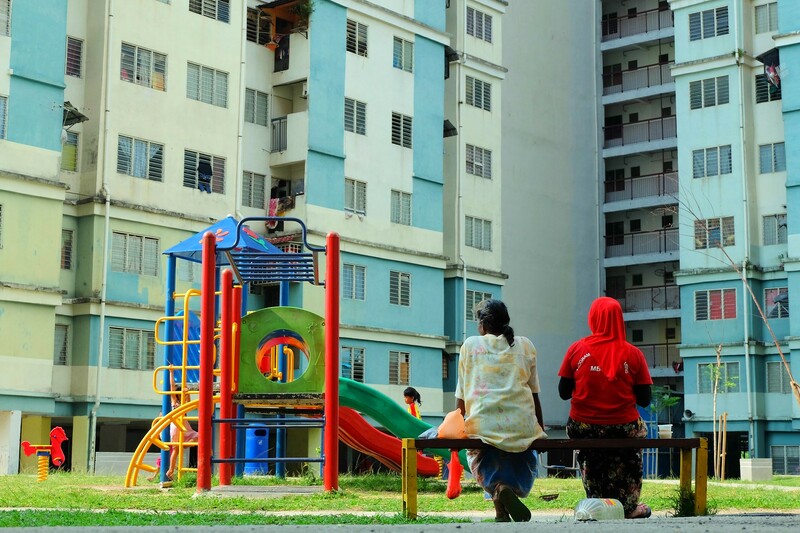 These findings stand in contrast to the question asked in the Parliament last year on income distribution of the nation’s residents, where it was declared that there is a decrease of about 0.421% of people in poverty in Malaysia. Moreover, in order for citizens to hold the Selangor state government accountable, civil society could use this data as evidence to demand that allocated budgets are increased in order to give financial/welfare support to disenfranchised communities in Kota Damansara public housing. What’s next? In order to measure the impact of open data and social audit, we are planning a follow up of urban poverty surveys. Since the upcoming general elections will be held on 2018, the follow up of the surveys will be applied each 4 months after the first survey, in order to document if there are any changes or improvements made by the decision makers for better policies in the respective constituency and making better budget priorities that match the proposed/approved public policies.